The new STAGEPAS 400i and 600i are the successors of the STAGEPAS 300 and 500, which earned worldwide acclaim as compact, yet high-powered, portable PA systems with exceptional sound quality. By combining new high-efficiency amplifiers, newly designed speakers, and high performance DSP, the new STAGEPAS systems deliver a significant increase in power output (400W for the 400i and 680W for the 600i) as well as substantial improvements in sound quality and reliability. Complementing the boost in performance, the addition of iPod/ iPhone connectivity, SPX digital reverbs, an onboard feedback suppressor and more versatile EQ, has improved functionality and ease of use considerably, allowing STAGEPAS to meet the demands of a much wider range of applications and users. Features of the STAGEPAS systems include one-knob master EQ with virtual bass boost, high resolution SPX digital reverbs (4 types, parameter control) and a detachable mixer. The 400i features an 8-channel mixer (4 mono/line + 4 mono/2 stereo line inputs), while the 600i incorporates a detachable 10-channel mixer (4 mono/line + 6 mono/3 stereo line inputs). 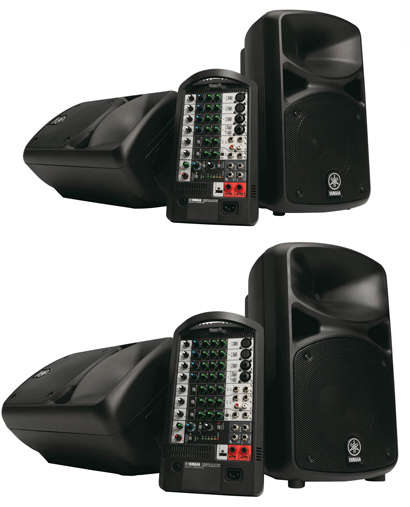 The combination of great sound quality, useful features, flexible inputs and portability make these systems ideal for wedding speaches and lots of other mobile DJ related uses.